A good idea can be gathered of the general construction of milling machines from photo illustrations. But there are certain details which cannot be understood or explained clearly without detailed drawings. Chief among these is the Universal Indexing and Dividing Head, which is one of the most remarkable elements in machine tool design, by reason of the very high degree of precision embodied in it. The same remark applies to feeds, to be considered in another article. 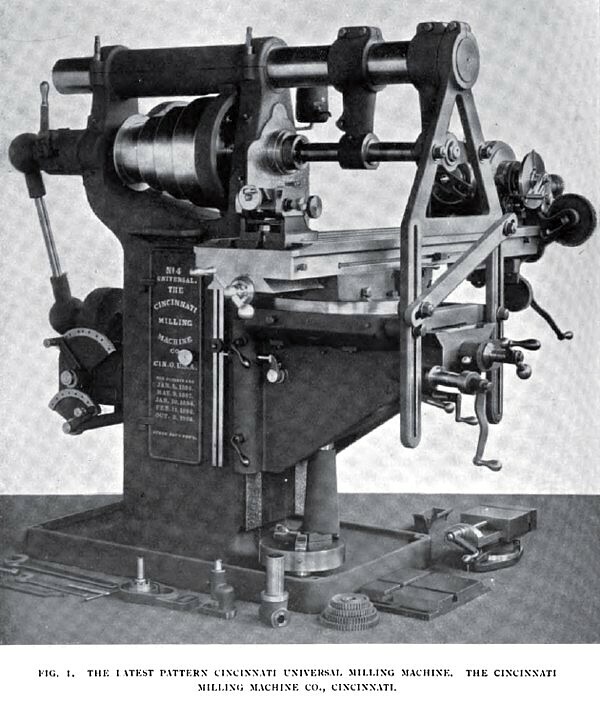 A machine is rendered universal by the fitting of a spiral head and index plate, in conjunction with a swivelling table and change gears. The index plate gives divisions of a circle, and change gears impart the spiral movement while the table is being traversed by the feed screw. Though there are similarities in external appearance in most dividing heads, yet there is a good deal of difference in detail and in workmanship. We cannot do better under these circumstances than illustrate one of the best and latest types with sectional views, that of the Cincinnati Milling Machine Company, of Cincinnati, Ohio. The general appearance of the machine itself as now made by the firm, is seen in fig. 1. The swivelling block, A, which carries the spindle, B, makes a complete revolution in the vertical direction. This it has in common with some other modern heads, but in general the movements of heads are confined to angles ranging from 10 deg. below the horizontal and 10 deg. beyond the perpendicular. And when cutting spirals the movement is still large, ranging between 5 deg. below the horizontal to 50 deg. beyond the perpendicular. The capacity for complete revolution is in some cases an advantage, because it permits of the cutting of right- and left-hand work without changing the cutter, and the cutting of the same piece of work on either side of the perpendicular. Moreover, the swivelling block is contained wholly within its bearings at whatever angle it may be set. By means of a new clamping arrangement it is held securely in any position without strain being thrown on the spindle. 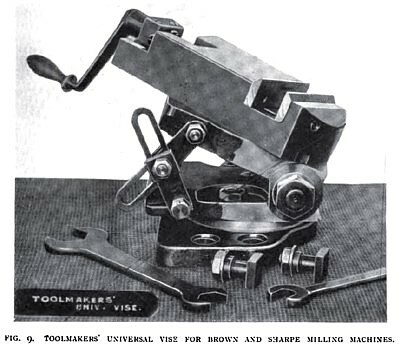 This comprises two trunnion bearings on the swivelling block, embraced by the clamping rings, C, pinched by two cap screws, D, the action being similar to that of clamping a shaft tightly in its bearings. 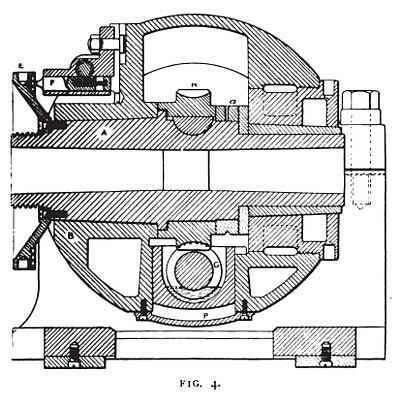 In this case the circumference of the trunnion is very large, with the result that no disturbing influence can possibly affect the spindle or the worm gear. The edge of the swivelling block is of course graduated into degrees. The spindle, A, is provided with a clamp ring at it, which secures it endwise, and does not disturb its accuracy. The coned bearing neck at the front and the coned bushing at the back afford provision for taking up wear. The hollow spindle has a tapered hole in front. These include the worm and wheel, and a special and very convenient index plate, E. The latter is used for getting low numbers in order to avoid the risk of mistakes that sometimes occur in counting the number of turns of the worm for low numbers. Divisions under 40 are obtained with this plate. On all divisions of 40 and over, more than one turn of the worm is not required. The plate, E, for direct indexing, is dish shaped, and has three circles of holes, 24, 30, and 36 on the back, in a position where they are protected from dirt and chips. This, with the adjustable pin, F, is seen in sectional detail in fig. 4. The pin holes for 4 and 6 divisions, which are so frequently required for fluting, nut-making, etc., have their positions indicated on the edge by figs. 4 and 6, so saving the trouble of counting the holes. This plate has a further and subsidiary utility, since when it lies in a position approaching to the vertical it affords protection to the cutting head from falling chips and oil. DISCONNECTION OF WORM AND WHEEL AND THEIR ADJUSTMENTS. The worm, G, and its wheel, H, are seen in gear with each other in the drawings. To effect their disconnection the worm is dropped bodily in its bearing or case, J. This, it must be noted, is a vertical movement only, and not an eccentric one. It is effected by the eccentric pin, K, that moves the case bodily up or down. As the latter is confined sideways, the eccentric end of the pin is inserted in a bushing, L, which has endlong motion in the worm case, and so produces the motion. The screws, M, tie the worm case to the block above, which is drilled for L, and by means of these screws the worm is adjusted to the wheel. This is a straight line movement, as it should be. At the other end the worm case swivels about the pin, N, as a centre. There are thus two separate adjustments provided, and each in a straight line, that for taking up wear by the screws M, and that for engagement and disengagement by the lever, K, and sliding pin, L, both of which are ideal arrangements, theoretically correct. The worm is single-threaded, and righthanded, with two and a half threads per inch. It runs in a bath of oil supplied through the tube, O. The cap, P, can be removed for purposes of cleaning and examination. The wheel has the usual forty teeth, so that forty turns of the handle, R, move it through one revolution. Both it and the index plate are of good size. The index plate, Q, is drilled from both sides, so that when reversed it provides a large number of divisions without having to use extra plates. Extra special plates are however provided for effecting divisions that cannot be obtained directly from the standard plate which is furnished with a machine—the principle being the addition or subtraction of fractions—adding or subtracting two indexings. Such divisions have hitherto been obtained by the tedious method of compound indexing. The work is rather puzzling to the uninitiated, and a description of it would encroach too much upon the space at our disposal. The dividing or indexing head is used on plain milling machines as on universals, but the change gears for spiral work only upon the latter. The illustrations, figs. 3 and 5, render this distinction clear. In fig. 5 the revolution of the handle or index pointer, R, turns the worm and its wheel through equal gears, S, T. When spirals are being cut the worm is driven through the gear, U. The connecting up of change wheels from the lead screw, V, is illustrated in fig. 3, W being the swing plate, and X one of the two studs for compounding trains. The motion is transmitted to the spindle at right angles by the bevel wheels, V, actuating the spur wheels shown in fig. 5. The dotted lines of these bevel wheels are seen in fig. 3, in which details may be noted, by the way, of the ball thrusts to the lead screw, Woodruff keys to the worm wheel, and some of the fixed gears; also a fine adjustment of the index plate by ratchet and pin for resetting work. But we must now give some attention to the methods of operating this piece of mechanism. THE METHOD OF INDEXING, AND OF CUTTING SPIRALS. We start with the fact that the arrangement of gears permits the spindle to be rotated automatically at whatever angle it may be placed, that the index plate gives equal divisions, and that the change gears impart a rotary motion to the spindle, the amount of which bears a relation to the pitch of the lead screw. As the worm thread and the worm teeth are as one to 40, forty revolutions of the wheel to one of the worm form the basis of calculation. The value of the index plate used in conjunction with this lies in making sub-divisions when the crank or pointer has to make less than a complete revolution to effect the required division. Thus, forty turns of the crank effect one revolution of the main spindle, and one turn would effect a fortieth of a revolution of the main spindle, and therefore this operation would have to be repeated forty times to obtain forty divisions to the circle. 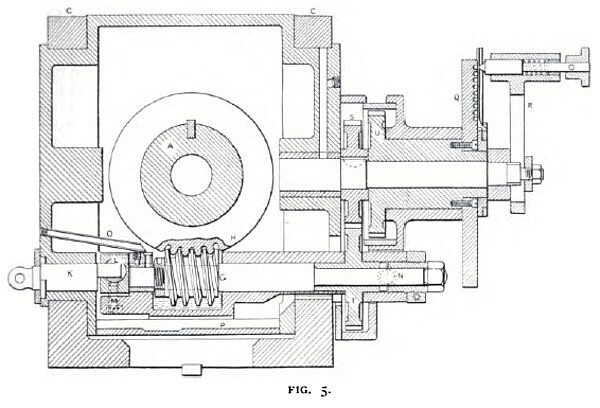 To obtain eighty divisions the crank would be turned but half way round for each division; to obtain twenty, two turns would be required. Hence the rule—divide 40 by the number of divisions required, and the quotient will be the number of turns or parts of a turn which will have to be imparted to the crank. Or, taking a number, say 144, then ,40/144 may be reduced to ,5/18, which means that the crank must be moved, 5/18, of a turn. In getting into these fractional parts it is necessary to select circles of holes which are either of the number required, as 18 in this instance, or a multiple of the same, as 36, 54, 72, etc. Here the value of the sector comes in, because the counting of holes is liable to error. Having a sector once set to, say, every fifth hole in the 18 hole circle, or tenth hole in a 36 hole circle, further risk and trouble are saved. The sector is seen in figs. 2 and 3. It is set to one hole more than the spaces to be counted, and there clamped. That is, the hole in which the index pin enters is not counted, but the 5, or 10 holes, or other numbers as may be required are counted apart from this one. When the sector is tighiened with its screw, no further counting is necessary, but it is simply moved against the index pointer for each division. When this has been repealed the proper number of times, and a cut made at every setting, the main spindle in the dividing head will have made one revolution. To facilitate this work, and save the labour and risk of calculation, is the reason why index tables are furnished, which give opposite the number of divisions required the number of holes in the index plate which may or should be selected, and the number of turns of the crank required for the circle of holes given. These tables may, of course, be used merely as a basis to work upon, other circles and numbers of turns being easily deduced therefrom. The dividing head used alone finds its applications in fluting taps and reamers, in cutting wheel teeth and ratchet teeth, etc. But for spiral teeth, and for twist drills and spiral milling cutters, the spindle must be rotated by the change gears. These are exactly the same as for screw-cutting in lathes, but the subject is approached from a rather different standpoint. Thus, instead of taking the pitch of the screw or spiral as the basis, the distance through which the table travels during one revolution of the spindle in the dividing head is given, and this is termed the lead of the spiral. If the spindle makes one turn to 6 in. travel of the table, the lead is 6 in. ; if one turn in 10 in., this is a lead of 10 in. The calculations involved are simple, because the lead screw usually has four threads per inch, and forty revolutions of the worm are required to impart one revolution to the spindle of the dividing head. If gears of equal diameter were put on the lead screw and on the worm shaft, the lead screw would therefore have to be revolved forty times to rotate the worm shaft forty times, and in that period the table would travel 40, divided by its pitch 10 in. Other gears are obtained by multiplying the required lead in inches by 4. Having obtained the ratio in the form of a fraction, the latter is divided into two, as in screw cutting, and the numerator and denominator of these fractions are multiplied by a number to give numbers of teeth of wheels in the set available. This applies to compound gears. In a simple train two wheels give the ratio, one going on the worm shaft, the other on the lead screw, with an intermediate, which, of course, may be of any size, to connect them. The setting of the table to the angle of the spiral to be cut is obtained either graphically or by the aid of tables. In the first case, the hypotenuse of a triangle is taken, one side of which equals the lead, the other the circumference of the spiral. In the second case, the circumference is divided by the lead, and the quotient compared with a table of natural tangents, and the table set to the degrees obtained. Or a table is consulted which gives a wide range of angles for different spirals. Fig. 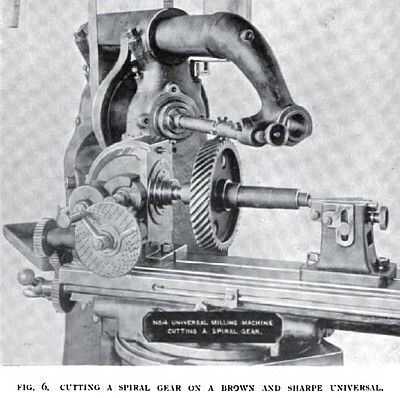 6 illustrates the cutting of a spiral gear on one of the Brown and Sharpe universals. In this head the spindle is rotated in a curved seating in which it is clamped. The spindle can be rotated independently by the worm and wheel, since the worm can be thrown out of gear with the wheel by an eccentric bushing. The spindle may then be turned by hand and locked by the index plate and pin. In the head for the No. 1 or smallest machine, steel bushings afford a bearing for the worm shaft, and a pivot for the spindle box, and the front end of the latter is set by suitable graduations to any angle from 5 deg. below the horizontal to the perpendicular. In these heads the worm wheel has forty teeth, and the worm is a single-threaded one. 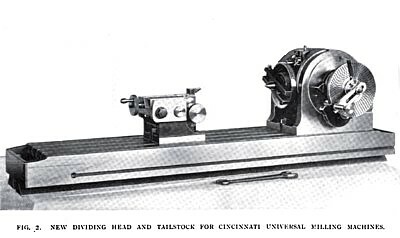 A special spiral head by the Cincinnati Milling Machine Co. is designed for cutting coarse spirals, for which it is better adapted than the regular head. The worm is double threaded, and of 1½ in. pitch, and the wheel is 8¾ in. in diameter. These are used on both plain and universal machines. Division is effected by plates and index peg. Two plates are fitted in the Cincinnati, one for getting all odd divisions up to 50, the other all even divisions up to 100. The spindle is hollow, with a standard taper at the front end. The nose is threaded and covered when the chuck is not in use. To relieve the index pin and plate from strain, the spindle is clamped firmly in position during cutting. To extend the range of service, raising blocks are fitted for increasing the height of centres. When work has to be carried at each end, as in fluting taps, reamers, drills, cutters, etc., the tailstock or footstock is used in conjunction with the dividing head. This is seen in figs. 1, 2,3, and 6. That of the Cincinnati Company is seen in some detail in fig. 3. The housing, AA, carries the longitudinal slide, BB, which fits into it with a dovetail, being traversed by the knob, CC, and clamped by the bolt, DD. The centre bar, EE, is double-ended, one end having an ordinary centre for heavy work, the other being reduced on the top face to enable cutters to clear when fluting, which frequently approaches very near the centre of the work. The position of the bar is readily reversed. It is adjustable vertically with rack and pinion, actuated by the knob, FF, and clamped by the bolt, GG. The centres can also be tilted forwards, swivelling about the centre, DD, graduations on the housing giving exact angles. The Brown and Sharpe footstock is made on another pattern. Two taper pins are used to adjust the centre in line with the headstock centre. To set it at an angle, a rack and pinion are used. The centre is clamped firmly by three nuts. 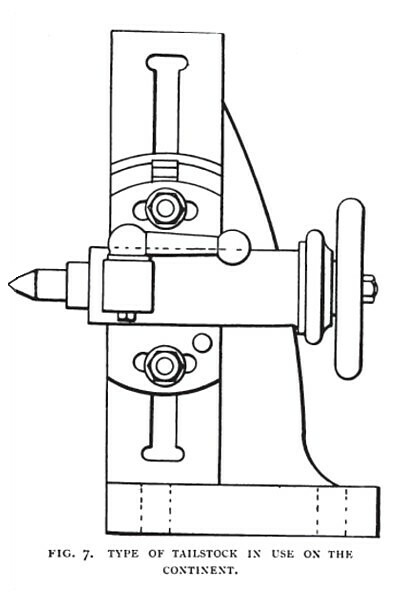 A different type of tailstock, fig. 7, is common on the Continent. It comprises an upright on which a swivelling block that carries the centre is adjustable vertically, a screw being frequently used for convenience of moving the block. The latter is made to swivel for the purpose of supporting the outer end of taper work, when the taper is long, and the angle large. 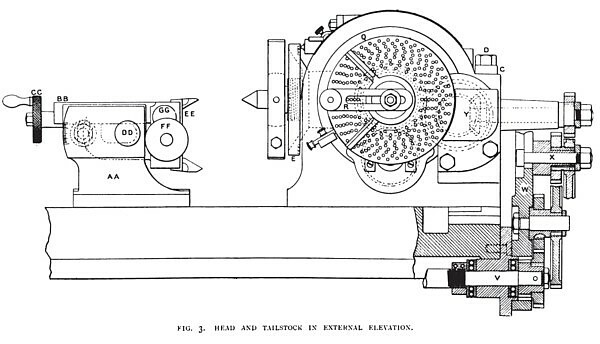 It provides the same movements as the American and English patterns, but a screw is used instead of a rack for the vertical movement, and the mechanism is entirely different. There are numerous other attachments made to plain and universal machines with the object of increasing their range of service. They generally comprise a high speed fitting, and a rack cutting attachment and vises. Frequently also a table for rotary milling, a cam cutting device, a vertical spindle, and a universal attachment. 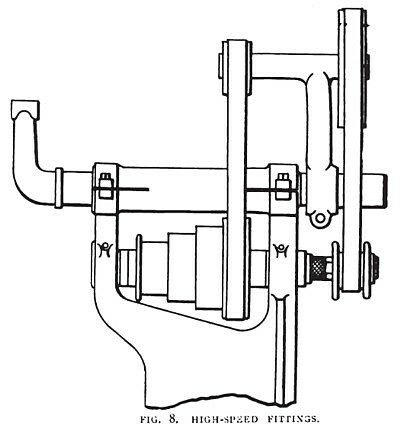 The high speed fitting, fig. 8, is used for light end mills chiefly. It comprises a spindle which runs in a shell that fits the taper hole in the main spindle. It is driven by a belt from above, which is operated by a belt and pulley driven from the headstock main cones. The pulleys have their bearings in a bracket, which is clamped on the overhanging arm standing above it, or some equivalent device. Speeds of over 1,500 revolutions per minute are thus obtainable. In a rack cutting attachment a pair of bevel gears changes direction of motion from the spindle to the rack cutting spindle and arbor running parallel with the table. The advantage of changing the axis is that there is no limit then to the length of rack it is possible to cut. The racks are held in a specially long vise. By fitting a slitting cutter, stock can be sawn off by the same attachment. A circular milling attachment is often very valuable for conveniently doing work that would otherwise go to the lathe. Rectangular vises are made in various designs to bolt to the machine tables to hold work parallel with or at right angles to the table, to swivel to horizontal angles or to vertical angles, and having graduated edges. One of these, by Brown and Sharpe, is shown in fig. 9.